This is CUDA accelerated software able to mine Equihash coins (Zcash (ZEC), Bitcoin Gold (BTG), Bitcoin Private (BTCP), etc.). This software is compatible only with Pascal based GPUs. According to the developer this miner can achieve over 500 solves per-second for GTX 1080 without overclocking or any mods – on stock settings. Each 15 seconds solver logs its counters of hashes/secs and solves/secs disregarding the first reported speed (it is lower due to initial handshake with the pool). The miner comes with dev fee which is exactly 1.5 percent of all submitted shares. Also make sure to use the latest NVIDIA drivers to get maximum performance possible. 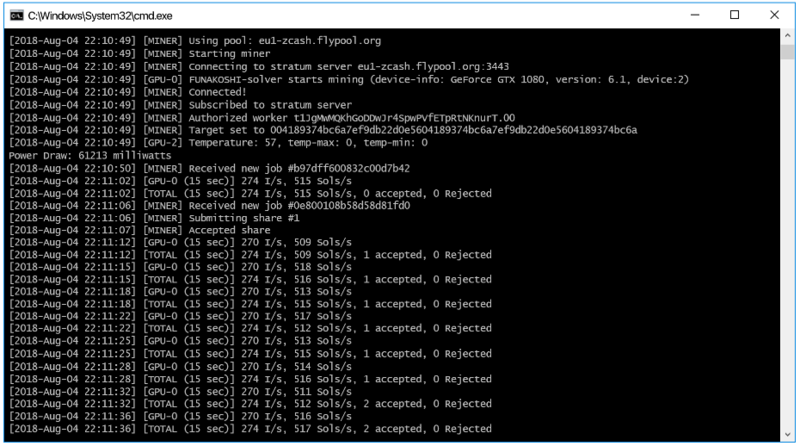 Do note the miner requires CUDA 9 so be sure to download library from the developer’s links provided below and place it in the same folder with miner. In case to have nvml.dll error launching miner, assuming you have the latest NVIDIA drivers installed, just copy and paste nvml.dll file from Program Files\NVIDIA Corporation\NVSMI to folder containing the miner or just download nvml.dll library provided in the links below.